NOTE: - THIS ADDENDUM CONTAINS POLITICAL OPINIONS, which due to the nature of the subject matter is simply unavoidable. ON this one section this report has been forced to deviate widely from its originally intended purpose. That being solely to obtain “originally” to obtain some actual real world financial numbers that we could use to determine the financial impact re-legalization would have on our states general revenues. And as re-legalization would open the way for Industrial Hemp growth in Oklahoma, to examine and try to determine just how much in new state revenues would it create. However, as with any commodity, especially one for which we due to a myriad of issues, we have no recent or specific data for. Obtaining any kind of financial figures has thus proven to be a quite challenging task. However, necessity being the mother of invention, we “originally” thought to obtain at least a ball-park figure by obtaining a Maximum figure (as per Sec 6.9.1) and then a minimum figure (a Sec 6.9.2), which would at least give us a starting point. And then “hopefully” with some deviation-al math, come up with a realistic figure we could at least plug in somewhere to obtain our ballpark figure. HOWEVER, things didn’t quite come out that way. TRUE THIS REPORT WAS PUT TOGETHER BY individuals who strongly support re-legalization. But by anybody’s standards, it appears that the pessimistic viewpoint was totally . . . well, let’s just say that logic and reason wasn’t one of their strong points. While the financial figures put together by the optimists were at least based on actual financial figures, those put together by the nay-sayers were (how shall we say it) not really based on anything. In fact, the more research done on their reports, the more and more it became obvious that there was something very, very wrong with the very constructs of their arguments. In some cases, it even appears as if they were deliberately trying to deceive. But whether they were or not is irrelevant, as arguments (especially financial arguments) should be based on actual facts, NOT on emotional gabble-gook. When this report was first being put together, there was always the intention of being fair-minded. No matter how pro-Industrial Hemp the compilers of this report were, it is important not to look at things through the rose colored glasses of wishful thinking, but instead, to hear both sides of the issue and report their opinions as openly and objectively as possible. We would have been doing everyone a disservice had we not done so. Thus, our original intention was to simply compile a listing of the “pessimistic” viewpoints or concerns, presenting them in a reasonable and fair manner. When using their own math and work out (as closely as possible) their financial findings, the idea was to be fair to all viewpoints. However as more and more information on their viewpoints was gathered, it became obvious that something was terribly wrong. Why were so many uses of deceitful statistics? Why so many uses of mathematical slight-of-hand? Why were so many obvious (to an informed reader) farming factors being left out? At first, the situation was a bit confusing, then it became obvious what was going on. The reader should be informed that our Narcotics Police (at least at the Federal level) are not only clear to lie, but as per the Control Substances Act are REQUIRE to do so in order to prevent re-legalization. Yap, no lie, It’s even official, the DEA, the Drug Czars Office are required by law to lie. Or as they put it; mandated by the control substance act to do anything, including lying, to prevent marijuana from ever being re-legalized. The Drug Czar is Required by Law to Lie Most people know that the “drug czar” — the director of the White House Office of National Drug Control Policy (ONDCP) — is an advocate for the government position regarding the drug war. But not everyone knows that he and his office are mandated to tell lies as part of their Congressional authorization. According to Title VII Office of National Drug Control Policy Reauthorization Act of 1998: H11225: . . . . The ONDCP staff lies all the time (and specific examples abound all over the web), but not all lies are mere simple statements. For those not familiar with the subject, the following websites contain some good information on the subject. Thus, if we accept the above as a fact and we must as even the federal government admits as much. Then the reader must admit, that at least the possibility exists that some of the so-called pessimistic reports/articles/viewpoints expressed about the future of Industrial Hemp in this country, might not at all be what they seem to be on the surface. In fact, given the history of our narcotics police, it seems all too possible that many of them were deliberately written up so as to deceive. Such is the conclusions reached while preparing this report. As it appears that the figures don’t add up, and neither do their findings. That our farmers simply can’t compete with (low cost) third world farmers. That Hemp farming is so uneconomical that each year, less and less acreage goes into Hemp production. Arguments that while true or not, while frivolous or not, are begin repeated so often that it is important to at least examine them. That the market for Industrial Hemp goods is only a fad and will soon disappear; Also that NO MASS market exists for Industrial Hemp goods anyway. Implying that only a few (we presume, unwashed hippies) are interested in no one else, thus no sense in growing it. Etc. REPLY: Granted there are numerous groups and individuals who take this point of view. Some appear very desperate for any excuse to keep Industrial Hemp out, while others sound like they actually believe what they are saying to be true. In all cases their argument seems to be centered around what appears (to them) to be a lack of “critical mass” (or enough market demand) for Hemp crops to justify any form of large-scale farming. (B) And no real market demand for Hemp anyway. Implication being that the fad would soon go away anyway and that would be that. And as proof of this, some of them they point out the fact that farm acreage under cultivation has been going down not going up. Which is circular logic at its best; ---Meaning totally worthless. And the same can be said about the Circular Logic arguments against Industrial Hemp growth. “In many countries, Industrial Hemp is against the law. "A situation is created which snowballs down to the manufacturing level. "Local retailers have no locally made hemp merchandise to sell." "Consumers don’t buy locally made hemp goods." "A situation is created where consumers do not buy Hemp production." "There is no reason to re-legalize, as there is no market for it"
NO EVIDENCE of any DRUG SALES taking place, even outside the story premises. In effect NOTHING, and worse yet, because so many different agencies were involved, there was also no chance of planting anything anywhere. Yet still, despite the obvious, they sill went out and made the arrest; -- An arrest made NOT upon any physical evidence, but solely based upon “the profession opinion of the head Norman P.D. Narc. Something to the effect that some of the smoking pipes being sold at the store might be used for illegal substances. And as far as they were concern (for their purposes) that was good enough for government work; --The arrest was made. Now, this example is brought up, not to bring up an injustice, but simply to emphasize the point that farmers will not/cannot, grow Industrial Hemp (even where technically legal) UNTIL AND UNLESS the HARASSMENT is first and foremost stopped. First natural fibers seem to have (what the industry terms) the ability to breathe, which make them comfortable on a hot-muggy day. Synthetics simply don’t have that ability. Next, while not as cheap as synthetics, natural fibers seem to be much softer. And while true some burlap type fibers don’t fit the bill, Hemp (if processed right) can be just as soft as cotton. Hemp (while requiring moist soil to grow) does not require anywhere near the water resources that cotton does. It does not wear out the land to anywhere near the same degree as cotton so you don’t have to use nearly as much fertilizer. It is a weed controller in that the plant grows so fast, it blocks out the sun, thus preventing weeds (below) from growing. But best of all, it will grow in areas where other natural fibers are impractical. And the list of advantages could go on and on. Thus, this report must conclude that those who believe that this is all some kind of Back To Nature Fad, are in error. Simply put they are ALL making use of circular logic, which if broken (aka, re-legalization) causes their whole logical arguments to fall apart. Whether intentionally done or not, this is probably one of the most misleading tables ever put together. In a figure of speech, it comes complete with a giant alligator lurking in the swamp. First note that the table (as put together) makes it appear that a potential Hemp farmer might loose her shirt, should she run into the low fiber price of minus $200 per acre. Meaning the farmer might loose $200 per acre on the deal. Thus giving the impression that NO FARMER would want to grow it with that kind of risk involved. Fiber Hemp - Low Fiber Price, is the stuff that comes from hemp stalks that broke (into little pieces) somewhere during the milling-processing process. This is natural and traditionally consists of around 20 to 25% of any given hemp crop. 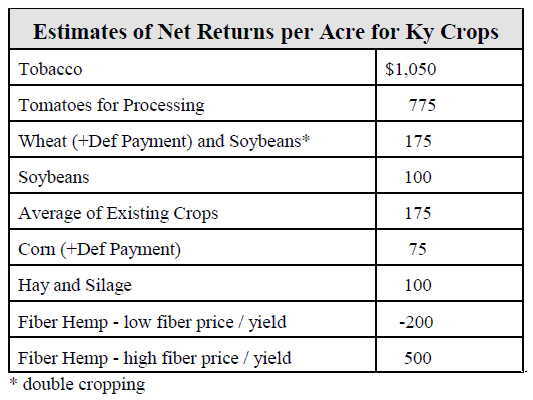 So that “minus $200” accounts for no more than 25 percent of the crop grown. Which means that (had the table been so stated) that Hemp fibers are more profitable to grow than EVERY OTHER CROP on that table, with the exception of “Processing tomatoes” and “Tobacco”. And as if to add insult to injury, the table still contains other major faults. It (intentionally or not) completely ignores the fact that the Fiber Producing parts of the Hemp Stalk accounts for only around 25% of the stalks volume. The Hurd part of the stalk (not mentioned in the table) used to manufacture everything from building materials to paper products, is also very saleable and commands a good price. In fact from data provide by the European Union, the price of Hemp Hurd is in some cases is now as much as the fiber. And seeing how the stalk contains between two or three times as much Hurd as fiber? This in effect raises the price a farmer can expect to obtain by a multiple of two to three times what was shown. Thus putting profits per acre well above the price of “Processing Tomato’s” and right next to “Tobacco”. Last of all, the above table completely IGNORES ANY SEED PRODUCT, which might also have been obtained. However, in all fairness, one can either grow Hemp for seed or for Fiber, but the two don’t necessarily equate. Thus the table (as shown) is somewhat mis-leading to say the least. Yet, the problem is that ALL such reports seem to be making use of hanky-panky figures, which appear for all intents in and purposes specifically designed to deceive. Simply put, their using evasiveness “slight of hand“ maneuvers to jimmy the math in their favor. That Hemp growth is just not economically feasible in America, so the argument goes that farmers would do better growing other crops commanding better prices. If true, that would be a logical argument that should make farmers think twice. However the problem here is obvious. If such statements were correct than how is it that Canadian and West European farmers are able to have hemp crops? Thus something must be wrong with the logic somewhere. And truth be told at one time that was correct. Historically at one time, America had tens of thousands of acres devoted to Industrial Hemp production. Even up until the beginning of the Reefer Madness Hysteria campaign, we still had a small but vibrant industry. Yet today, the best guess-timent put the acreage under cultivation at around thousand at most. And can be said for the Europeans, at one time they were exporters of some of the best Hemp fibers out there. Yet today, thanks in part to their own failed war on drugs, their hemp industry is barely recovering. And the same can be said for many other parts of the world. Simply put, from a historical viewpoint (which is the one being quoted by the pessimists), Hemp production up until recently was indeed on the decline. But in terms of the here and now, it’s on the up-tick. And why shouldn’t it be that way, with the exception of the third world, which is now suffering from food insecurity issues. 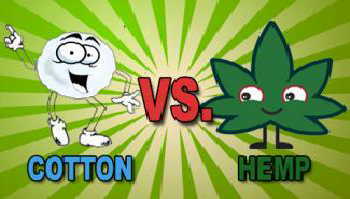 The rest of the world has re-discovered that they can grow more Hemp (acre per acre) then you can cotton, and people simply want to ware clothes. That Hemp growth is just not economically unfeasible in advanced countries because third world farmers will simply wipe us out with their cheaper labor/cost structures. And there is some truth to this, as we must never forget that the original reason why our Home Grown Hemp industry fell into decline was the introduction of cheap (much cheaper) imports. However, it is felt by many (in fact by just about everyone) that given today’s farming technology, that many of the old labor intensive function historically associated with hemp grown have now long ago been eliminated. Thus also eliminating much of the advantage that third world farmer’s used to enjoy. In addition, given this planets’ “Food Security” problems, especially as it affects the third world, it is believed that fiber production is not something high up on their lists. That the needed farm equipment (seeders, tractors, harvesters, etc) for Hemp production has not yet been developed. Implying that it will be years and year (maybe decades) until the proper farm implements are created. The Canadian farmers ARE NOT growing Industrial Hemp? The European farmers ARE NOT growing Industrial Hemp? Are a whole host of others NOT growing Industrial Hemp because the equipment has (according to the argument) not yet been developed? Or for that matter, America’s WW-2 “Hemp-For-Victory” era farmers didn’t grow tons and tons of Hemp during the Second World War? One can only presumes that the prohibitions would like us to believe that all we see around us with our eyes is nothing more than a mirage. STATEMENT OF FACT: The equipment needed for Hemp production exists, and it is even possible adjustments) to take any piece of farm machinery and (with minor adjustments), convert it for full Hemp production. The list of arguments can go on and on, but by this time it is hoped that the general reader gets the idea. The prohibitionist or nay-sayer side of the argument (if one can call it that) simply isn’t telling it the way it is. They are either knowingly and willingly, with the intent to deceive, saying things they know not to be true, or they are basing their assumptions more on emotional and political viewpoints rather than actual agricultural facts.